Many new parents struggle with the choice of what products to buy and not to buy. Diapers are a key item seeing as how your baby is always going to have to pee or poo. Even if you are not a new parent and would like to try something new, it’s still sometimes nerve-racking. Which is why I’m here to help you. In this article, I will show the Seventh generation diapers reviews. The total ins and outs. First, before we purchase a product we ask ourselves what do they have to offer? What does this brand have that others may not? 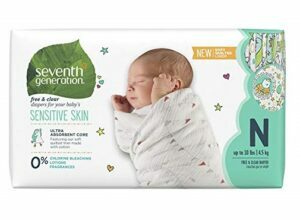 Seventh Generation Diapers can form to almost any baby’s allergy needs. They offer chlorine free, fragrance-free, gluten-free (in case your baby licks their diaper), hypoallergenic, latex free, mineral oil free, paraben free, petroleum free, phthalates free, and sulfate free diapers. Now some of these I didn’t even know could irritate a baby’s bottom! In addition to the all natural diaper, they also offer a night time diaper, which I think is fantastic. As parents its always relieving to know that your baby or toddler can stay dry throughout the night. Waking up in a puddle of urine is never fun, seeing as how when you have children there are always unknown substances on your body. Another great feature is that the diapers are also cruelty-free, which means you can diaper your baby knowing they were made purely out of love. Both the baby and the diaper. Pros of these diapers would be that they don’t leak. As said before that is often a huge deal breaker with infants. You want your baby to sleep dry and not wake in a fit because they soaked through their diaper during the night. They will surely wake cranky, as will the parents the next morning. Many parents often see a decline in the number of diaper rashes or redness during changes. But if you do see any need for a cream they also offer one from their brand. Seventh Generation diapers also require no membership fees. So you are able to buy the diapers themselves and not pay an additional monthly fee. This is the best diapers for sensitive skin. Diapers are also eco-friendly so you can diaper baby and help the environment. It is the best natural diapers another amazing feature is they have diapers with an umbilical cord cut out for newborns. Which makes it extremely convenient for changing and diapering your baby. With these diapers, you wouldn’t have to fold down the top like other brands, to prevent from rubbing or possibly tearing off the umbilical cord stump. If you are a pattern lover you can also choose more than a plain green diaper. They have pattern and color options that are all dyed naturally and won’t cause any irritation or transfer color onto clothes. Now we have some cons, such as not so cozy diapers. Some parents have also noticed leaking which is a major issue with smaller babies. But as long as you can get the size you need then it can be prevented. The patterns are not as colorful as some would like and there are not many to choose from. Babies are also very expensive when you are buying smaller packs of diapers the price can seem high. So I would recommend buying larger boxes rather than smaller. If you aren’t sure of your child’s weight then you can always try on a diaper first and judge the fit. The top of the diaper on the backside should come halfway up his or her back. If it is too low or too high then you will need to go up or down in size. Another great tip to avoid diaper mishaps is to make sure that it isn’t crooked. Which can also cause leaks and then lead to wasting money. Overall being a parent is hard work. Every day you are faced with new products and new prices. You try to do the best for your baby at all costs. You try to stay in the know and on top of the latest features. I think this is a great product. It seems to be a bit pricey at times but for the overall quality it balances out. As long as you buy the correct size diaper and be sure to change the dirty ones your baby will survive. The most important thing to remember as a parent, in general, is to be kind to yourself! You are on a new journey as is your baby. Read the reviews about seventh genera diapers and try the samples, you may stumble upon your new favorite brand of diaper.so we’ve put together seventh generation overnight diapers reviews that are currently available at Amazon.